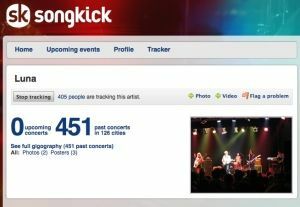 Almost a year ago a friend of mine put me in touch with Ian Hogarth one of the founders of gig tracking site Songkick. Ian told me that they were planning a new version of the site and was interested in meeting up to talk me through what they were planning and how I, or more specifically A Head Full of Wishes, might be able to help. I met Ian and Michelle from Songkick over a lemonade in a pub in Shepherds Bush where they outlined, with huge enthusiasm, what they planned to do. A Head Full of Wishes' role in the new Songkick was to be one of the many sites that Songkick planned to trawl to create their huge archive of past concerts. I met Ian & Michelle again a few months later to have a look over the alpha of the new Songkick and got a warm glow seeing that their database was filled with hundreds of Galaxie 500, Luna, Damon & Naomi and Dean & Britta gigs. I couldn't wait to get in there and start building my own personal database of gigs I'd attended over the years. This morning Songkick's new site was rolled out to the world and is a joy for all gig-goers. The ability to keep a track of all those past (and future) concerts, and to interact with people who were also there (or will be going), as well as uploading pictures and videos make the site a huge amount of fun. And with it already full of gigs that you probably went to it's a fairly trivial process of building up your own gigograohy. Head over there and feel free to track me down and check out my shady heavy metal past and keep an eye on what I'm up to.